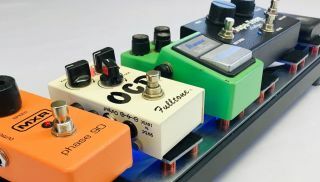 NAMM 2019: Rare Earth Music has updated its flagship Earthboard pedal board system with sleeker and more low-profile components. The Earthboard, which the company touts as the first-ever magnetic, battery-powered effects pedal board, boasts a distinctive design that utilizes rare-earth-magnets, a double rail system, long-lasting rechargeable battery and proprietary “Gravity Boots and Tethers” to address the inherent hassles and frustrations of conventional boards. The system eliminates the messy tangle and cobweb of cords and the need to spend time searching for wall power, as well as does away with hum and noise interference.